This weekend was the beginning of “potty boot camp” for Q. Basically, this amounts to him being naked from the waist down and us taking the risk of him marking his territory wherever and whenever he pleases. This activity doesn’t come with much of an upside, but after a couple of days of snafus, including my sweet (limited edition) Adidas shoes getting pee’d on and finding puddles with my feet, he has started to grasp the message that the toilet is actually a cool place on which to hang out. In other weekend adventures, I took my first flying lesson sans wings or even an airplane. I decided I’d try it via my skateboard by hopping up onto the curb like I used to twenty nine years ago. Well, a lot has changed in that time – flying now also includes falling, followed by bruised ribs and road rash, which I’m currently recovering from. My Tony Hawk moves didn’t go to waste, though; the “stunt” performance took place in front of my daughter, so now she has the perfect visual of what not to do on her board. But instead, I made this amazing cherry, balsamic and red wine compote, and life became normal again. Sweet, but still rockin’ a great onion flavor, this relish was perfect for the lamb burgers. In fact, it’d be good on pork, beef, venison, chicken or even goat cheese crostinis…it’s good on anything! 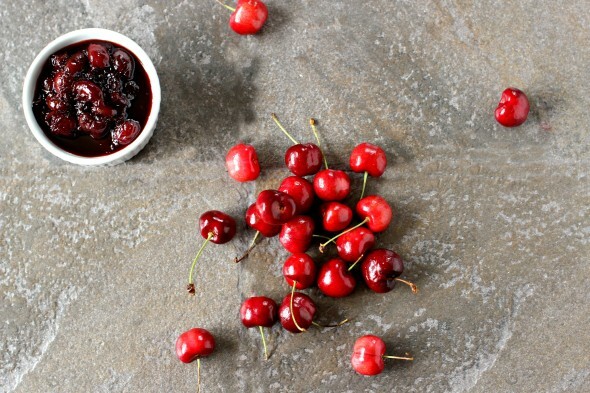 Cherries are everywhere right now, and thanks to OXO and their ultra handy cherry pitter, you can have a truckload of fruit ready in almost no time! Don’t forget – you can subscribe via email or catch my RSS feed on Feedly to receive all the latest updates. Check out my Facebook and Twitter, too! 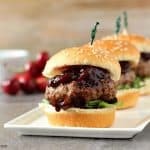 Juicy lamb sliders with a balsamic cherry relish. Heat the olive oil in a pan and add the sliced shallots. Cook for about 3 minutes until soft. Add the cherries, balsamic vinegar, sugar and red wine. Cook over a low-medium heat for about 20-25 minutes and the liquids become thick and glossy. The cherries will break down, that's okay but I like to still keep big chunks of fruit in the relish. While the cherries are reducing, make the mini lamb burgers. Preheat your grill to a high heat. In a bowl, combine the ground lamb, fish sauce, cumin and pepper and mix well, I like to use my hand and make sure it gets mixed really well. Form the meat into small patties about the size of the palm of your hand. You should be able to get 6-8 patties from the meat. Lay the burgers on a baking tray and then place each one onto the grill. Cook untouched for about 5 minutes per side or longer if you like them well done. Once they're cooked, transfer to a plate and let rest for 5 minutes. Take a mini bun and lay a burger patty on the bottom half. Spoon some of the cherry relish onto the meat and place the other part of the bun on top. These sliders sound amazing! I love the sweetness of the cherries mixed with the lamb! Great idea! What a great recap! I love that movie by the way. I feel those same emotions almost every single day as I sit in my cubicle. 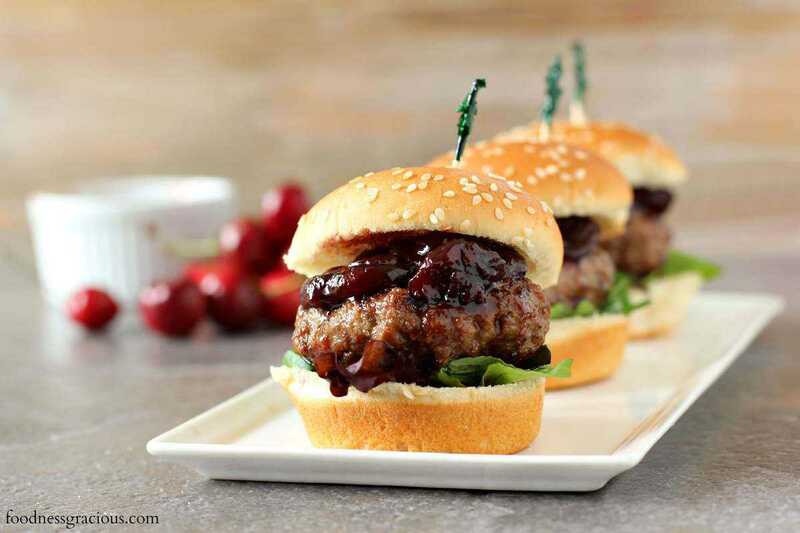 Anyway – the sliders look so juicy and the cherry relish – oh my! Good luck on the potty thing – you’re such a great dad! Happy Father’s Day to you! That movie is a classic Tricia, thanks for the kind words! This is totally and completely my kind of recipe! 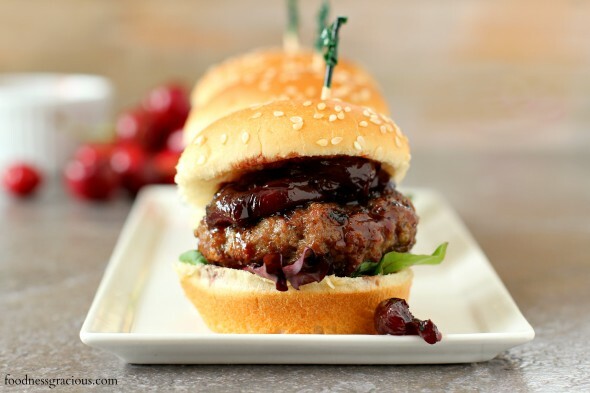 Love lamb, love sliders… and cherry-balsamic puts it over the top! Oh my word, that sounds like… well, quite the weekend. :) But hooray for lamb sliders and cherry-balsamic relish saving the day! YUM. Will this relish go well with Fish, Pork, Chicken or Beef? Hey Nancy, I would say any meat for sure and maybe a firmer white fish like cod or halibut, good luck! These sliders look fantastic, Gerry. I want to try that cherry relish! Thanks Angie, it’d be good on so many other dishes! I’m loving that relish, cherry and balsamic sound fab together! Those sliders sound amazing, and I know Son would be all over that cherry relish! The combo of cherries and balsamic sounds insane! Such great and enticing photos! Your sliders look amazing, such great ingredients – I know these are wonderful! Although I am not a big fan of lamb(which is kinda weird considering I am Greek haha) you sold me on these sliders Gerry! This looks so good! I love sliders, especially lamb. This is the perfect snack/finger food, yummy! Whoa – Jason would go crazy over these! I’ve never cooked with lamb too so this should be quite an experience for me. And that relish – YES! I just received the oxo pitter too – can’t wait to finally put it to good use! Gotta watch out when you try the old tricks! I was always terrible on a skateboard but now I feel wobbly even on a bike. I’ve been thinking about making lamb burgers/sliders recently. I love the addition of cherry balsamic relish, these might be the ones for me! Cherry balsamic relish, wow! What a great recipe. I definitely will try it! Gerry, so glad you brought this over to the BBQ. I have signed up to follow you with my new bestie, Bloglovin. I hope to see you again soon. So sad that you didn’t get a video of your skateboarding, we could have gotten you on Ridiculousness, ha ha. These sliders are just the ticket and I don’t even love lamb. Those OXO pitters are the best, aren’t they? This looks absolutely delish…I’m drooling all over my computer. I bet the cherry/lamb combo is AMAZING! 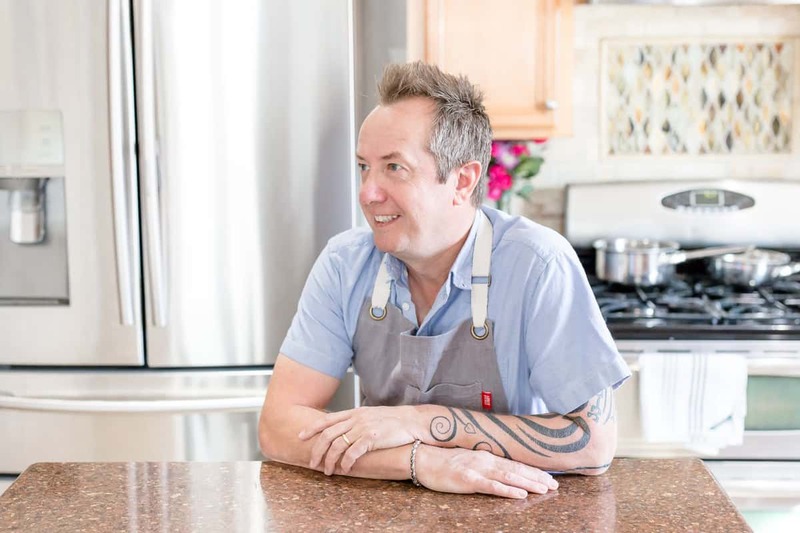 I’m hosting a “get your grill on” link party and spice giveaway that ends tonight at 11:59 pm…I’d love to have you share this recipe because I think others would love it too! Great Idea! We have done leg of lamb with crusted dried cherries, but would never thought of this slider application. Many thanks! Hey Gerry, I’m going to make these on Monday night just for me and Jason when the kids are out of town. What kind of side do you recommend? Hey :) you could go with some frozen french fries or sweet potato fries from TJ’s with a salad, or roasted brussels sprouts. If you’re grilling, try some grilled asparagus with some grated Parmesan, salt and pepper. Have fun!